Book #27 has been selected and we’ll have our noses in it for the next few weeks! 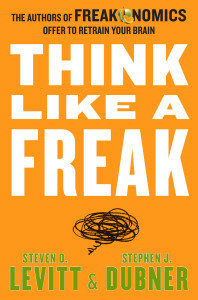 It’s Think Like A Freak by Steven D. Levitt and Stephen J. Dubner. Get the book at Amazon in Hardcover, Paperback, EBook or listen to the Audio book. Think Like a Freak is not a book about how to understand magic tricks. That’s what Dubner and Levitt’s first two books—Freakonomics and SuperFreakonomics—were about. It’s about the attitude we need to take towards the tricks and the problems that the world throws at us. Dubner and Levitt have a set of prescriptions about what that attitude comes down to, but at its root it comes down to putting yourself in the mind of the child, gazing upwards at the double lift: free yourself from expectations, be prepared for a really really simple explanation, and let your attention wander from time to time. If you have suggestions for future books to be read for the show, questions for us or just something you need to say — contact us on Facebook, Twitter or send us an email.